…is designed to recreate an authentic Medieval Market 'feel' through the use of specially-fabricated stalls showcasing carefully-selected products alongside attractions to provide visitors with an entertaining and memorable experience. Why are we still fascinated by Medieval History? In an age when life was short and rarely sweet for the vast majority, when rivalry and violence was prolific across the kingdoms of Europe and where fear and ignorance of the unknown encouraged blind faith, you could be forgiven for thinking that this was an age best forgotten. However, consider the number of ceremonies, processions, festivals and pageants with a Medieval heritage that are still celebrated and it is clear just how much interest this age still holds. There is a continuing fascination with the chivalry, intrigue, pomp and glory of the medieval period - while the struggle between that which is pure and that which is corrupt is what makes this period of history so accessible to all. The colour, imagery, characters and stories passed down from generation to generation are the exciting legacy of the Medieval period. We also have the daily visual reminder of these times in the form of Gothic and Medieval architecture as testimony of this bygone age. Against this back drop, and with these images, Market Square Group has designed a market recreating the character of the middle ages. 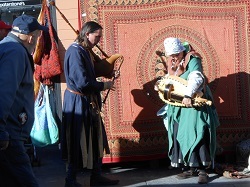 The Medieval Market combines a sense of fun, visual stimulation and discovery within a unique retail experience. This original themed street market offers high value entertainment and products carefully selected for their quality, value and validity within the event. 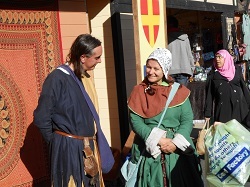 Our aim is to remain true in spirit to the medieval age by recreating a market place that engages the senses through sight and sound and presents a highly plausible selection of foods, goods and market characters. 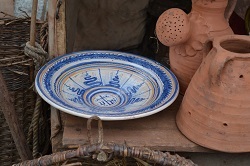 As well as very fine victuals, including traditional hog roast, old English ciders and venison from the King’s woodland, there will be crafts, clothing, fine jewellery and demonstrations of traditional skills by the likes of Mr James Newboult from the trinity Pottery in Nottinghamshire, the company of Artisans from the South East of the country and the tireless jesting of our favourite fool, Mr Devil Stick Pete. 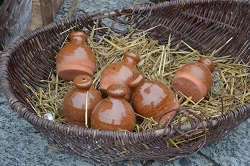 Stall holders will be in medieval attire with stocks on site for anyone found to be less than enthusiastic among the visiting crowds. Don't be surprised if King John sits down beside you in the picnic area - he may want you to try his food first as it would not do for the King to be poisoned before one of his loyal subjects! We have created a themed market with products in keeping with this particular period of history. Traders will be selected from the UK, the Continent and Eastern World from where food and goods would have found their way to Europe as a result of the crusades to the Holy Land. Market Square Group currently holds a database of more than 5,000 traders, incorporating an extensive range of product areas. Our selection of goods will provide value and validity in terms of traceability, sustainability, nutritional content as well as quality of craftsmanship. Heraldic Flags will be flown throughout the market. As it is indirectly the King through the local Barons who is the patron of each market, it is fitting that the knights of the realm and their family colours are represented throughout. As any of our referees will testify, we actively encourage the participation of local businesses as part of our own company ethos.